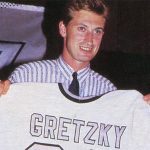 When Wayne Gretzky was traded from the Edmonton Oilers to the Los Angeles Kings, other players were also involved in that deal. 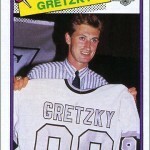 We tend to forget that sometimes, as “The Trade” was really, more or less, a Gretzky-for-$15 million dollars swap. But several more guys changed teams too. 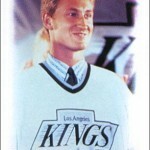 One such player was Mike Krushelnyski, who went with Gretzky – along with Marty McSorley – from the Edmonton Oilers to the Los Angeles Kings. Martin Gelinas and Jimmy Carson – along with some draft picks and mad amounts of cash – in turn went to the Oilers. The trade rocked the sports world, and to a lesser extent a few hockey cards. 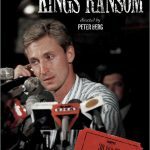 Gretzky’s 1988 hockey cards featured up-to-date photos (see last week’s article) showing him in a new Kings uniform, but Krushelnyski here was not as lucky. 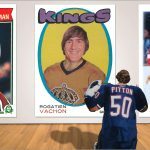 The O-Pee-Chee airbrush artist really went to town on this pic of the Kings forward, painting over nearly his entire body. Look at the bright side – at least they painted on the “new” Kings uniform, and not the old purple and yellow one. That would have looked really stupid. So what’s wrong with this picture? First off, the card looks more like a bad painting than a photograph. I don’t think hockey jerseys get that “wrinkly” in real life. And what’s up with that unrealistic gradient-glare on Krushelnyski’s helmet? The light source would have to be really close to his head in order to produce that strong of a glare. 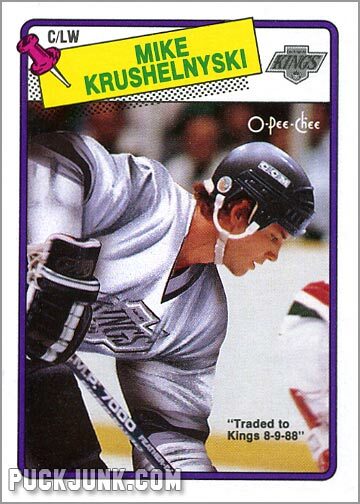 Not to seem overly nitpicky about a 20-year old card, but if the glare on Krushelnyski’s helmet was that bright, then the wrinkles on his jersey would not be that dark. But I’m not done. 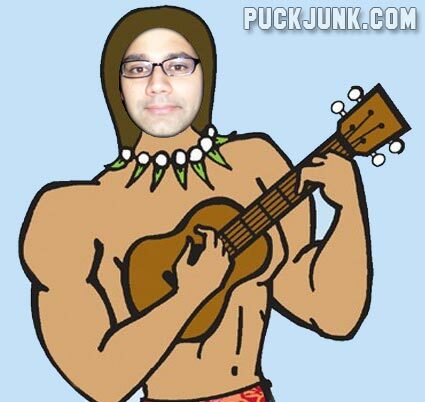 If you follow Mike’s gaze downward, you’ll see the elbow of a New Jersey Devils player – wearing a home white jersey. OMG!!! It looks like both teams are wearing their home uniforms at the same time. That would confuse the hell out of the referee and anyone still watching a black-and white TV. This card might have looked cooler and work better if they instead painted on a Kings black road uniform. Mind you, back then teams wore their white jerseys at home and their dark ones on the road – the opposite of what is done today. Remember those cardboard cutouts you’d see at carnivals or amusement parks? You know, the ones where the body is a drawing – something like a muscle man – and the face is cut out, so you can stand behind it and look all stupid while someone takes your picture. Well, that’s what this Krushelnyski card reminds me of. A little reworking of the concept and you too can be a member of the Los Angeles Kings. I don’t think anyone over the age of eight would be convinced by the photo on this Krushelnyski card. 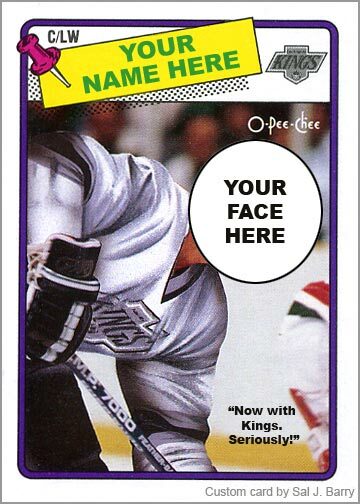 Most likely, I don’t think anyone at O-Pee-Chee was convinced either, as the text “Traded to Kings 8-9-88” was added somewhat hastily to the front…perhaps because the back still listed him as a member of the Oilers. 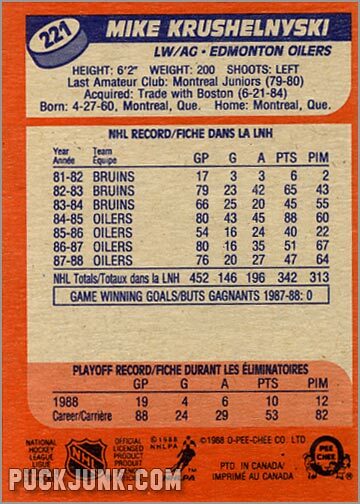 Ironic that O-Pee-Chee would spend all this time altering the front of the card, only to ignore the back. Krushelnyski was a part of the biggest trade in sports history and got a crummy hockey card in the deal. Great post Bruce. You know, I’ve always wondered at what exact point in time teams switched from wearing the whites at home to the darks. By the way, I should have your package on its way by the end of the week, I’m just waiting on something I picked up on eBay specifically to include. Hey, thanks! But I’m not Bruce, I’m Sal. 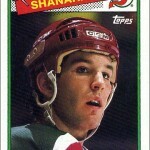 But I’d still like to get a package, Shane–hopefully it contains hockey cards!